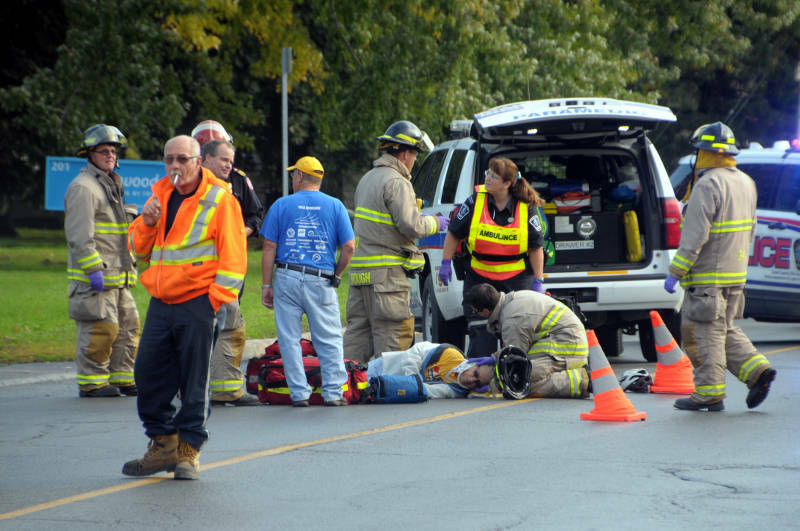 CORNWALL – A cyclist has been taken to hospital by paramedics after a collision between a car and a mountain bike on Eleventh Street East Tuesday morning. The Cornwall Fire Department, Cornwall-SDG Paramedic Services and the Cornwall Community Police Service were outside the entrance to Heartwood Long Term Care, east of Sydney Street around 10:30 a.m.
“The gentleman (cyclist) was going (west) down Eleventh Street and the car went to turn and the cyclist ran into the car, over the hood and on the ground,” Platoon Chief Luc Richer told Cornwall Newswatch. The Honda Civic had been exiting the long term care home entrance at the time. Richer added that the man was taken to hospital as a precaution. “He’s complaining of a sore right hip,” he said. The victim was fitted with a neck brace and put on a backboard before being loaded in an ambulance. A relative showed up at the scene to collect the man’s bike. At this point, no charges have been laid as an investigation is ongoing. An officer at the scene said he still had to interview the cyclist at the hospital before completing his report.